GREENSBORO, N.C. — National Radon Awareness month has spurred the NC Dept. 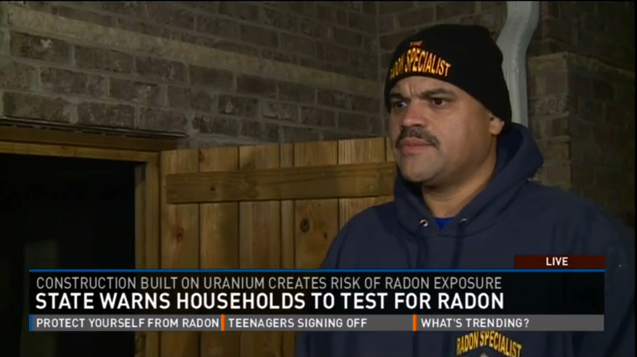 of Health and Human Services to encourage families to test their homes for radon–a natural gas that can cause lung cancer, if people are exposed long-term. According to DHHS, more than 20,000 people die each year of radon-induced lung cancer. Radon is a natural gas that forms when Uranium decays. Since Uranium is in most geographical formations throughout North Carolina, people become exposed to radon when their homes or buildings are constructed on top of such land. The North Carolina Radon Program has been reaching out to local health departments to educate individuals about the importance of testing their homes for radon. The program also encourages homeowners to use radon-resistant construction techniques and to work in partnership with local governments to further reduce risk of radon exposure in the state. WFMY News 2 spoke with the owner of the Triad’s largest radon mitigation company-The Radon Specialist. Abe Mendez explained there are three types of radon mitigation systems–sub-slab depressurization, sub-membrane depressurization and block wall system–most of which tend to range in price from upwards of $1,300. These systems redirect radon from inside the home to outside of the home, essentially “giving the radon a place to go.” Mendez said the best radon mitigation system for a home depends on whether the home has a basement, crawl space or neither. Mendez, who also is a duel certified as a radon lab analyst, said radon a gas undetectable by the senses. Therefore, many people do not realize they are being exposed to the gas and its long-term health risks. The Environmental Protection Agency recommends people test their homes for radon every two years, whether they have a radon mitigation system or not. Mendez said just because a neighbor’s home does not have high levels of radon does not mean the home next door is immune from the gas. He also noted new homes often can have high levels of gas, as well, so it is critical to get an inspection–despite the state’s lack of requirement for home inspections. Mendez said it is critical for people to ensure that the radon mitigation companies they hire have employees who are certified, especially because radon mitigation is not state regulated. He said it certification of radon testing and mitigation companies can be verified via radongas.org and nrsb.org. Mendez also warned homeowners to check for a “guarantee of reducing levels” clause in their contracts with radon mitigation companies, so as to avoid being charged for extra work deemed necessary after inadequate installation. For people who opt to self-perform a radon test with a test kit, Mendez said they must remember to use the kit in the lowest-level room of the house–whether it is a finished basement or first-floor master bedroom. Testing levels of radon in bedrooms, or other areas in which people spend the most time (except for the kitchen, are most effective and potentially life-saving. Mendez said some counties, like Guilford County, tend to have high radon levels simply because the county does not inspect homes or buildings as frequently as other counties. As part of the North Carolina Radon Program, some county health departments are giving away free test kits throughout the month. The Davidson County Health Department, located on Greensboro Street in Lexington, is holding an educational seminar and free test kit giveaway from 10:30 a.m. to 1 p.m. Other local health departments are having similar events throughout the month.